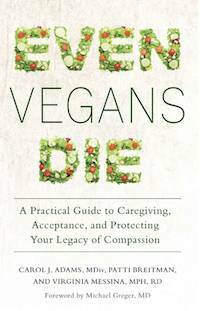 lauren Ornelas: Even Vegans Die knocked my socks off with its integrity. I was thrilled to read a book by three powerful women telling it like it is! It is so refreshing and easy to read. It is filled with sobering truth and firm, kindhearted advice reminding us that even our fellow vegans deserve compassion. Patti Breitman is an animal and health advocate and an expert public speaker. She is a former food columnist for VegNews magazine and writes an occasional blog on VegSource.com. Patti teaches cooking classes throughout the San Francisco Bay Area, where she lives. She is the author (with Connie Hatch) of How to Say No without Feeling Guilty. Virginia Messina, MPH, RD, is coauthor of Vegan for Life and Vegan for Her and of the first textbook on vegetarian nutrition for medical professionals. She writes and speaks on vegan nutrition for both consumers and health professionals. Ginny serves on the board of directors of Vegfund and on advisory boards of One Step for Animals, Veg Youth, and the Vegetarian Resource Group. She lives in Pittsfield, Massachusetts, with her husband and an ever-changing population of rescued cats.